Season 4 ends with a cliff hanger. Surprise surprise. 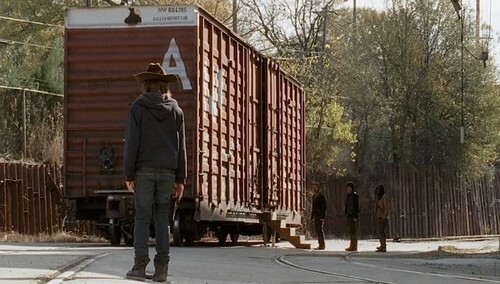 Rick, Michonne, Carl, Daryl, Abraham, Glenn, Rosita, Eugene, Sasha, Bob, Tara, Maggie are all held in a Terminus train car. They are likely being held to be eaten. The termites will only feed them powdered milk until the Termites are ready for them. The train cars seem to be mobile on the rail tracks. There is another car full of trapped people inside the compound. The group in the train car has no weapons on them. The Termites are very well armed. However, what the Termites don't know is that Rick just ripped a man's throat out with his teeth. There are some characters not at Terminus that could potentially help them. Beth (Whereabouts unknown), Tyrese, Carol, Judith, and Morgan. Morgan did not seem very sane last time he was featured but he may have recovered some. There are also some characters like Jesus, Father Gabriel that they have not met that could help them. Rick is not scared at all. In fact he seems to already have a plan. The Question: How do you think they escape? Any Ideas? What would you do? My thought is that the Termites go to great lengths to keep their captives from dieing and turning. SO start screaming that someone has died and is turning. Get the termites to open the doors. Draw them in. The somehow lock the doors open. Have Rick chew through someones neck. Escape and get to the hidden cache of guns buried outside of the walls. Then attack pull down the fences and make tons of noise let the noise and down walls draw in a huge crowd of walkers. Maybe have some car horns going off. Below is a picture of Rick from next season. It sure looks like Rick is coming up with a plan.